Peter Naur, a great Danish scientist and the first Danish professor within Computer Science at University of Copenhagen 1969-1998, died 3 January 2016 after a short period of illness. In 2005 Peter Naur received the most prestigious prize, the A. M. Turing Award, for his scientific contribution to Computer Science. 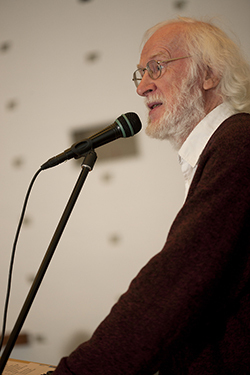 Peter Naur was founding father of DIKU, standing for Datalogisk Institut på Københavns Universitet, the first Danish Department of Computer Science instituted in 1970 as an offspring of Department for Mathematics. DIKU soon experienced a large boom in number of students and teachers. Since then the Department has undergone ups and downs, but its mission today speaks for itself with 800 Computer Science students and 80 staff and an ever increasing demand for new skilled computer scientists. Peter Naur (25 October 1928 – 3 January 2016) was a Danish computer science pioneer and Turing award winner. His last name is the "N" in the BNF notation (Backus-Naur form), used in the description of the syntax for most programming languages. He contributed to the creation of the ALGOL 60 programming language. He began his career as an astronomer for which he received his PhD degree in 1957, but his encounter with computers led to a change of profession. From 1959 to 1969, he was employed at Regnecentralen, the Danish computing institute, while at the same time giving lectures at the Niels Bohr Institute and the Technical University of Denmark. From 1969 to 1998 Naur was a professor of computer science at University of Copenhagen. His main areas of inquiry were design, structure and performance of computer programs and algorithms. Areas such as software engineering and software architecturehave also been pioneered by Naur. In his book Computing: A Human Activity (1992), which is a collection of his contributions to computer science, he rejected the formalist school of programming that views programming as a branch of mathematics. He did not like being associated with the Backus-Naur form (attributed to him by Donald Knuth) and said that he would prefer it to be called the Backus Normal Form. Naur disliked the very term "computer science" and suggested it be called "datalogy" or "data science". The former term has been adopted in Denmark and in Sweden as datalogi, while the latter term is now used for data analysis (including statistics and databases). Until the very last Peter Naur visited his old Computer Science Department at regular intervals.